As the demand for complex parts increases, so does the request for more effective ejection systems in injection molds. While the normal approach is to troubleshoot the system during mold trials, an extremely cost-effective alternative is now available to simulate the ejection process, to predict possible issues and to optimize the mold performance. 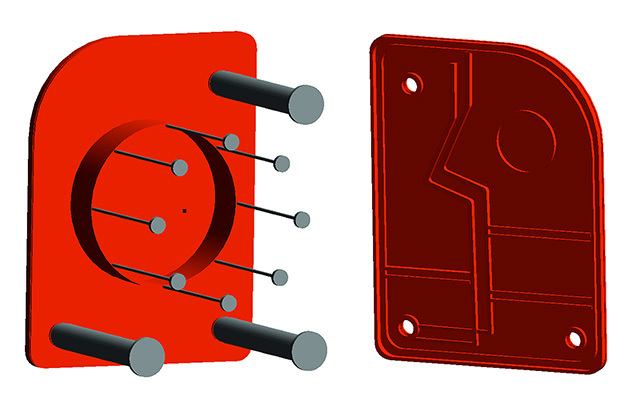 The design of ejector pins in injection molds is a task that often lacks a rigorous mechanical analysis. The geometrical configuration, as well as the contact area and the ejection pressure are normally based on previous experiences and problems are only identified once the mold is set up on the machine and first trials are started. This approach, while common, is risky and expensive: it is not unusual to find situations where the required ejection pressure perforates the part, or where the ejection pins are ineffective; in these cases some “last minute” changes in the ejection pin configuration must be done, delaying the production start. It is also common to find ejection configurations where some pins are not active in the ejection process, as the part shrinks “away” from them, and thus the manufacturing costs – and perhaps the mold complexity caused by them – is wasted. One of the most problematic situations is, however, the configuration where the part “sticks” to the wrong mold half, so that it is practically impossible to eject it. With a general demand for a single plastic part to integrate functionalities of several previous parts, as well as the increasing need for design differentiation, the complexity of the molded component increases, and in some cases previous knowledge related to effective ejection systems may result insufficient. For an example part an ejection system had been designed as seen in Figure 2. In this approach, the action of three large pins in the corners was supported by eight small pins on the cylindrical reverse. In practice, the part was sticking to the wrong mold half, and the company reached out to SIGMA Engineer Timo Gebauer to solve the problem. “The first approach was to run the mold virtually, just as in reality, to observe what was causing the ejection problem”, explains Gebauer. To accomplish this, SIGMASOFT® Virtual Molding used the complete mold information: all mold components where integrated in the analysis, including the ejection system. Several molding cycles were simulated sequentially, and afterwards a filling, packing and ejection analysis of the molded part was completed. “It is important to consider all mold elements in the simulation, and to simulate several thermal cycles. Some factors as thermal expansion, and thermal induced molded stress are decisive to evaluate the ejection behavior of the part”, states Gebauer. A viscoelastic material model, available in SIGMASOFT® Virtual Molding, was used to simulate the residual stresses present in the part as it shrinks against the mold cavity, producing contact pressure. SIGMASOFT® Virtual Molding was able to reproduce the way the part deformed during ejection, as well as the contact pressure present at each location in the part, as seen in Figure 1. It was evident that the small holes were gripping the part to the wrong mold half. “The part stayed in the movable half because the inserts used to shape the holes were retaining it, as the part warped constraining these inserts. This effect was evident when the contact pressure in the holes was analyzed”, explains Gebauer. The proposed solution was to make the ejector pins act as inserts to mold the part. “If the ejector pins build the cavity, the ejection system will work correctly”, declares Gebauer. “In this case, a detailed analysis of the deformation behavior was enough to identify the root cause of the problem and to find a suitable and low cost solution”. According to Gebauer, most of the ejection systems operate far from their optimum. This increases both costs and mold complexity, and in some cases it may compromise cycle time or part quality. With SIGMASOFT® Virtual Molding, an inexpensive approach is available to get insight in the mold performance and to predict the contact pressure produced at each part location. “This understanding is impossible to get in real life: all you see is if the part ejects or not, if it cracks or not. And if it does, you are not only wasting production time, you may also need to start rethinking your ejection system, without really knowing where to start”, adds Gebauer. Besides the reduction in iteration time in the real mold, ejection simulation in SIGMASOFT® Virtual Molding delivers understanding about the root causes of ejection problems. “The team can learn from these problems and avoid them in the future”. Also the mold performance is increased, building the reputation of a mold making department or company to deliver functional, reliable molds, even for complex parts. The productivity is increased, as instead of spending machine and personnel resources in iterations the mold’s start up is shortened, releasing resources for development and growth. “And last but not least, the design team becomes confident to engage in new, more complex projects, as a powerful predictive tool is there to back them up”, explains Gebauer.